> Development > Translations and Languages > How to setup KODI in Bengali Language. I want to setup KODI in Bengali language. So people of my country can easily browse/use kodi. Please tell me how do I proceed. What do I have to do? A guideline will be very helpful. I want to give it a try. A New Fan of Kodi. 1. There isn't currently any font provided with Kodi that supports the Bengali script. 2. It doesn't appear Kodi has implemented an open type shaping engine that is needed to properly render a font using any Indic script. So even if the font has "coverage" for Bengali (provides glyphs and instructions for the Unicode code points used in the translation to Bengali) it isn't assured that what you see on screen will render the "characters" of Indic scripts in the expected form. Unfortunately I don't know if there is any developer currently on the project with the knowledge to fix these two issues. The same thing applies with translations to Kannada and Malayalam that users have been interested in. Probably also Hindi but I haven't seen any recent support questions for this. @Klojum is an admin in transifix. 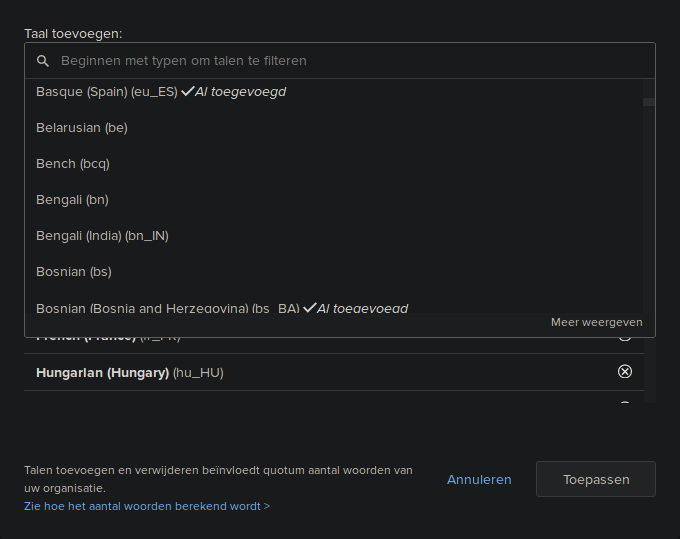 Unless Transifex is using an incomplete list of languages, I currently see only 2 options for Bengali. (yes, I use a dark theme in my browser). After that, those who want to do the translations will need to added manually by a Kodi Transifex admin.